July – 25 – 2010 – the Jordanian woman Amina Tariq, member of an animal protection association, was arrested yesterday noon by the police and transferred to the Zahran Security Center in Amman during a peace event in the First Circle Street of Jabal Amman. She was wearing Hijab and a long dress made of lettuce leaves, and raising a sign with slogans like “Let vegetables grow on you” and “Let the love for vegetables grow with your food”. 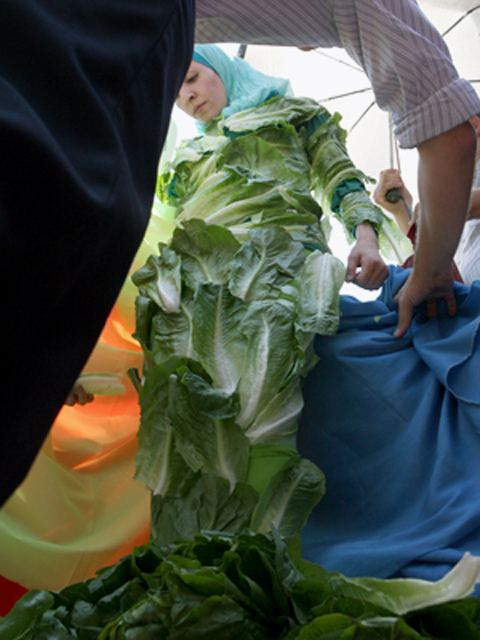 Amina Tariq, Jordanian Lettuce Lady. This “Lettuce Lady” who was present on Rainbow Street caused a major traffic jam in the area and escaped from the police after she ran away to a nearby restaurant. The police followed the girl and arrested her on the pretext of failure to obtain prior authorization for the event, of not having a permission to demonstrate in public, and causing a severe traffic jam. Hundreds of people gathered in the area of first circle where the girl was detained. According to Ammon News, the “Lettuce Lady” appeared on Rainbow Street wearing a full-length dress made of lettuce leaves and carrying a sign reading “Let Vegetarianism Grow on You”. Amina Tariq is a member of PETA (People for the Ethical Treatment of Animals) who appear in Jabal Amman to encourage Jordanians to follow a vegetarian diet. The Jordanian Police arresting Amina Tariq, "Lettuce Lady"
A statement was issued by PETA Asia Pacific said: “PETA’s Lettuce Ladies appear in various countries with the aim of drawing attention to the suffering of billions of animals which are raised and killed for consumption as food. The consumption of meat, eggs and dairy products is the number one cause of climate change and a major contributor to resource depletion, pollution and even world hunger”. slaughterhouses contaminate water sources. Farmed animals produce 13 billion metric tons of excrement each year; that is 48 times as much as the excrement output of the world’s human population. Much of the world’s water supply is quietly being diverted to animal agriculture; even desert nations in Africa and the Middle East are pouring what little water they have into meat production. Each day, animal growth consumes a shocking 2.5 trillion liters of water, enough for everyone in the world to take eight showers”. “We are asking people to turn over a new leaf and go vegetarian” says Jordan’s Lettuce Lady Amina Tareq. “With so many delicious alternatives to meat available, it is easier than ever to enjoy great food without killing animals and causing them any kind of suffering”.